Even though it features two more masked heroes, this is another example of my non-comics work. I’m a huge Green Hornet fan, from the original radio show to the 1960s TV series and beyond. I even found a lot to enjoy in the recent Green Hornet movie, even though it was far from my ideal of a Green Hornet film. Have you seen this short Green Hornet fan film? It’s badass! Anyway, I’ve had a couple of near-misses with getting to draw Green Hornet comic book properties, and hopefully some day that will yet come together. But in the mean time, there’s no reason I couldn’t go ahead and draw the character. This is the TV version of the Green Hornet, featuring Van Williams as the Hornet and the legendary Bruce Lee in his star-making role as Kato. The Hornet is depicted with his trusty gas gun, while Kato is shown taking out a pack of thugs bare handed. And of course no tribute to the Green Hornet would be complete without the Hornet’s rolling arsenal: The Black Beauty! This was a lot of fun to do, and I’d still love to draw a Green Hornet adventure one day! Misc Artwork | Christopher Jones | August 31, 2012 9:55 am | Comments Off on The Green Hornet Strikes Again! Speaking of the recent Green Hornet movie, this was done for a contest on AintItCoolNews.com that asked for a 5-panel cartoon depicting the meeting of the movie Green Hornet and his 1960s TV counterpart. I was one of the winners! Click the thumbnail for the large version in the Gallery. A new addition to the gallery. 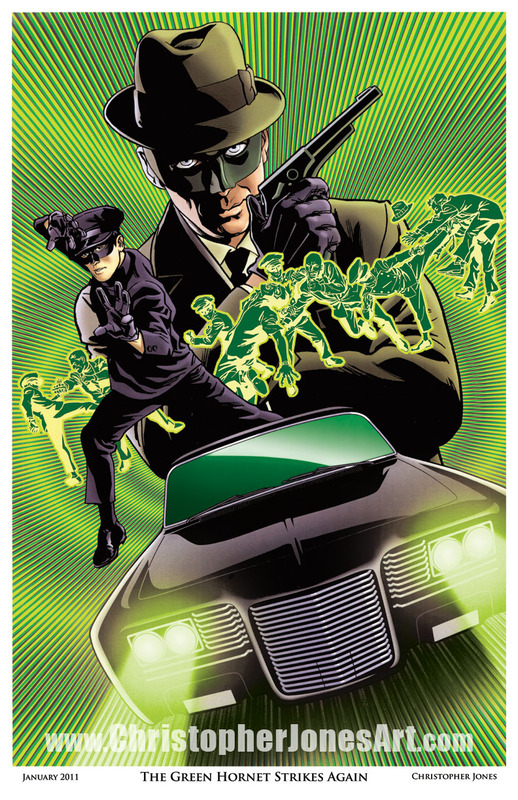 I’ve always loved the Green Hornet, from the original radio series to the classic 1960s series with Bruce Lee as Kato! I even enjoyed the recent movie, although I was frustrated that there wasn’t more use made of the classic Green Horent theme music. There’s more of it in Kill Bill! Anyway, here’s the art. Click the image for the larger version in the gallery. Uncategorized | Christopher Jones | 3:58 pm | Comments Off on The Green Hornet Strikes Again!